Cornrows are a popular, edgy hairstyle that reflects modern pop culture. A cornrow is a group of small braids that are tightly secured to the scalp. Cornrowed braids require meticulous design and take several steps to complete. The technique takes practice to perfect. Even if you’ve never cornrowed your own hair, you can practice on your own head and learn a basic cornrow in one afternoon. 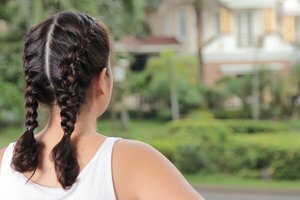 The easiest way for beginners to learn to braid their own hair in a cornrow is braiding the hair into cornrows that run straight back. The resulting cornrows will add flair to otherwise plain hair braids. Add moisture to the hair by spraying water or adding a hair moisturizer. 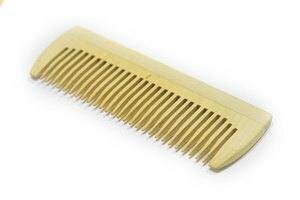 Comb through the hair to remove knots and pull the hair as straight as it will get. 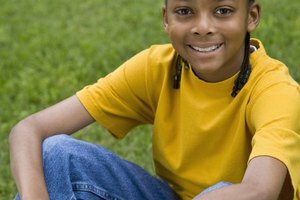 Do not straighten hair with a flat iron or relaxer prior to braiding the hair in cornrows. Part the hair down the middle of the scalp, from the middle of the forehead to the nape of the neck with a comb. This will create two equal sections of hair. Secure the two sections of hair with a clip or elastic band to keep the sections separate. Each section will be made into a single cornrow. 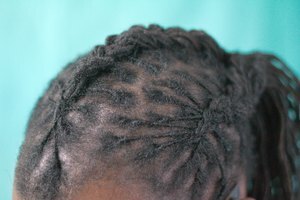 Continue parting the hair using the method if additional cornrows are desired. Remove the clip or band from one section of the hair. Use the fingers to separate a small section of hair near the scalp from the rest of the hair, which will hang loose. Separate the small section of hair into three equal sections that are side by side. Hold two sections in the left hand and insert the middle finger between each piece to keep them separate. Hold the other section in the right hand. Braid the three sections of the hair using the same manner used to create braids that aren’t cornrowed. Take one section of hair from the left hand and bring it over to the hair in the left hand, twisting one time to join the two sections. At the ends of the twist, the hair that was in the left hand will now be located in the right hand and the hair that was in the right hand will be in the left hand. Now, the right hand will have two sections of hair, separated from each other by the middle finger. Take one section of hair from the right hand and bring it over to the left side, twisting it into one section. Each section will switch hands, just as they did during the prior twist. Stop after two twists have been brought together to make one section of a braid. Continue to hold the three sections of hair in the palms, keeping each one separate. Use the pinkies, or any other free fingers, to grab another small section of hair underneath the braided section. Bring the hair from one-third of the new section into the next twist. As the next section is twisted, bring one-third of the hair from the new section into the braid. Continue to add a new section of hair below the braid to the cornrow, every time the one section of braid is created. This pattern will cause the braid to attach to the scalp and form a cornrow. Pull the hair tight and stay as close to the scalp as possible when making the braids. Continue braiding until the end of the scalp is reached. Braid the hair using traditional methods until all of the hair has been braided. Secure the end of the hair with an elastic band. Repeat this process to create cornrows in the remaining parted sections of hair. Pulling the cornrows tightly and braiding small sections of narrowly sectioned hair will cause the style to last longer. Apply hair moisturizer, wax, pomade or water to the palms while braiding to help the hairs to stick together. Section the hair using a variety of parts, such as zigzags and “T” shapes. 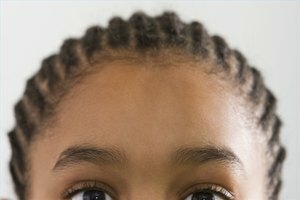 Don't pull the braids too tight because the hair can be pulled from the root or pain can occur in the scalp and head.